As I wrote in early November, I’m a big fan of Jameson’s original blend. Aside from bearing my middle name, the spirit is an excellent, top-notch, reliable whiskey that doesn’t command an unreasonable price. But maybe you’re looking for something a little more exquisite this holiday season. Whether you’re shopping for yourself, a friend, or a loved one, I don’t think you can go wrong with the new Jameson Irish Whiskey Gold Reserve. 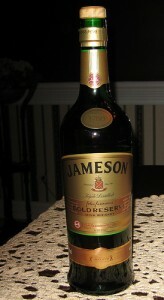 Gold Reserve was released in March as part of Jameson’s expanding Reserve Line of whiskeys. At about $65 per 750 ml. bottle, it’s more affordable than Rarest Vintage Reserve ($250) and the 18 Year Old Limited Reserve ($85), but pricier than the 12 Year Old Special Reserve ($35). Don’t let that ranking fool you, though; this is one phenomenal spirit that shouldn’t be overlooked. Not unlike the original blend, the pour is crisp and clean with an amber hue. I find fresh oak, syrup, and sweet sherry on the nose. The complex taste features a wonderful interplay between spice and honey, and the slightest tinge of vanilla fades in and out to keep things interesting. Intricate and enjoyable. The black pepper finish is extremely long and warm, a welcome characteristic that I think makes this whiskey easily compatible with most mild- to medium-bodied cigars. Since the sturdy flavor lingers long enough to take and taste a puff of smoke, you’ll have ample time to explore the relationship between the spirit and your cigar. Let me recommend trying Gold Reserve with a CAO Black, Davidoff Grand Cru, PG Gourmet II, or an Oliva Serie G.
Either way, whether you’re picking out something for that whiskey connoisseur on your list or rewarding yourself for conquering your Christmas shopping early, Jameson Gold Reserve will not disappoint. Nice review. I had a few sips of this over Thanksgiving break and was impressed. Wonderful complexity for the price, IMO. I received a bottle of 18 year old Limited Reserve and it's unbelievable smooth. For everyday, I do enjoy the "off the shelf" Jameson and I have never had such a silky smooth whiskey as what this brand has to offer.